Vivid colors and high-res patterns add sharpness to StyleFolio's easy-to-clean vegan leather cover, making your iPad Mini 4 look better than ever with a seamless, impeccable design. 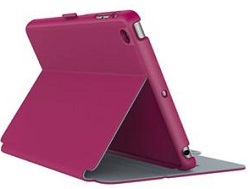 Multiple viewing angles in these must-have iPad Mini accessories make sure you’ll find the perfect angle, while a secure closure clasp holds your cover either folded or shut for when you're on-the-go. Auto sleep/wake magnets make turning your iPad on and off in a cinch. These iPad Mini 4 cases feature an all-around protective hard shell which keeps your iPad Mini 4 secure and scratch-free with a soft inner lining to protect from bumps, drops, and spills. A locking clasp secures your iPad Mini 4 in chic contrast color accents in either a folded mode or shut for when you’re on-the-go. Fuchsia Pink with soft anti-scratch Nickel Grey lining.